Today began with rain, which was okay, because my dad and I planned to drive two hours west to Bodmin Moor. Originally, I’d intended to visit Cadbury Castle, a Bronze and Iron Age hill fort that is believed to be a possible location of Camelot. Excavations have revealed that Cadbury Castle was in use during Arthur’s time—as well as hundreds of years earlier. We actually ended up visiting Cadbury Castle late Thursday afternoon, which was a good thing, because it was already remarkably muddy, and we wouldn’t have been able to get anywhere close if we’d waited until today. That being said, it was still difficult to visit, because so much of it was fenced off and the signs were not particularly clear. Since it is quite literally a hill, general tourists pass it over; so Arthurian enthusiasts have to actively seek it out. Nonetheless, my dad and I climbed up one of the slopes and still got a good sense of what the hill fort was like. I could completely imagine King Arthur sitting astride his horse overlooking his kingdom from atop of the hill. I seem to be spending a lot of my time this week doing just that: imagining things. Everywhere I go, even if it’s not directly related to King Arthur, I can’t help but imagine what it must have been like, in the past. This is probably a good thing, because it allowed me to get very excited about today. I had absolutely no museum/castle/cathedral/etc. visits planned for today. I simply planned to visit landmarks. 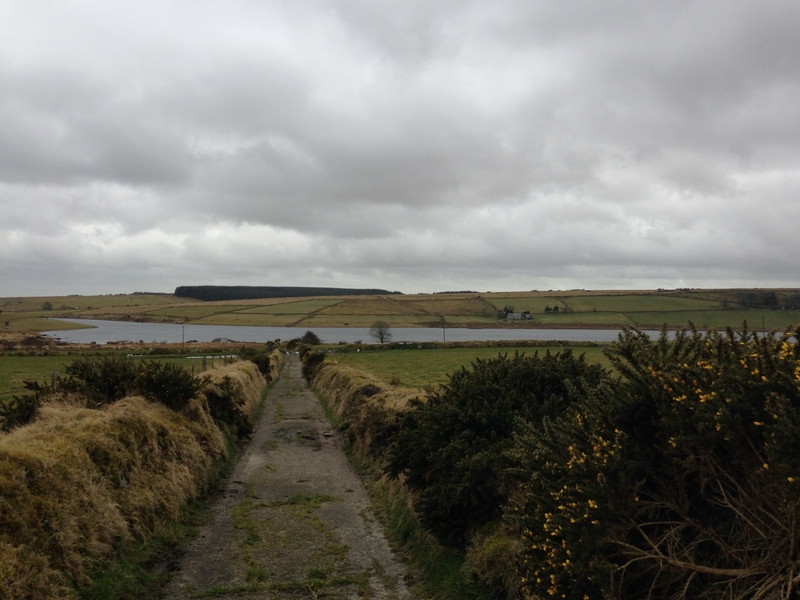 Along the drive to Bodmin Moor, my dad and I took a few detours to see some towns. Westtownians might be particularly interested by how we stopped at the ruins of Launceston Castle, where George Fox was imprisoned with other Quakers for eight months in 1656. After visiting Launceston, we eventually managed to find our first planned destination, Dozmary Pool. The GPS refused to guide us to a lake, and didn’t recognize any of the roads that were near the lake. We figured it out eventually, and I can honestly say it was completely worth it. Dozmary Pool is a potential home for the Lady of the Lake, and it’s believed that Sir Bedivere threw Excalibur into Dozmary Pool following Arthur’s fatal wound at Camlann. The lake was gorgeous. Bitterly cold, with exceptionally strong winds, but stunning. 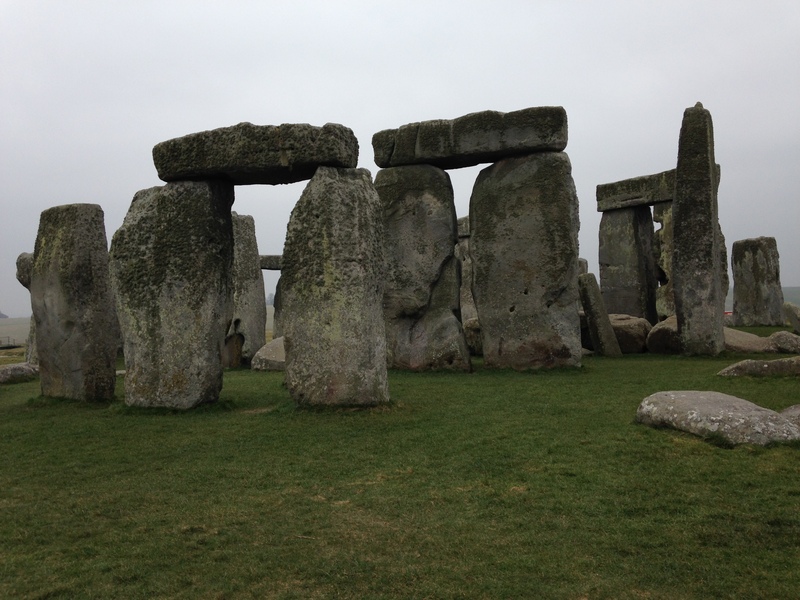 It was surrounded by grazing sheep and low mists, in the middle of nowhere, and truly gave off a mystical, ancient vibe. I’d read that the best time to visit was at dusk, but I was afraid we’d get lost if we visited when it was nearly dark, however with the on and off rain, the mists were just the right amount of gloomy to paint a picture of a time long past. 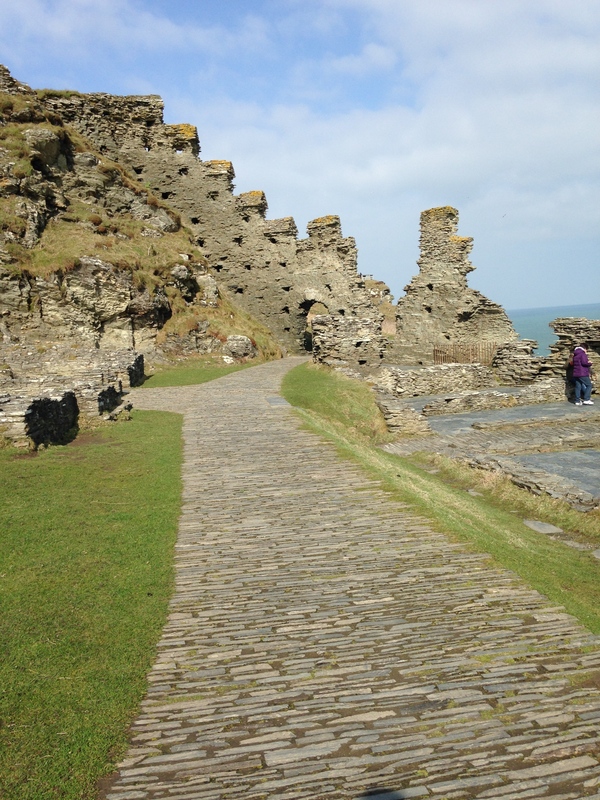 Following Dozmary Pool, we drove down to Fowey, Cornwall. This wasn’t Camelot; it was King Mark’s land. He generally featured in the legends of Tristan and Yseult. Yseult was Mark’s bride from Ireland, but she fell in love with his nephew (and a knight of the Round Table), Tristan. 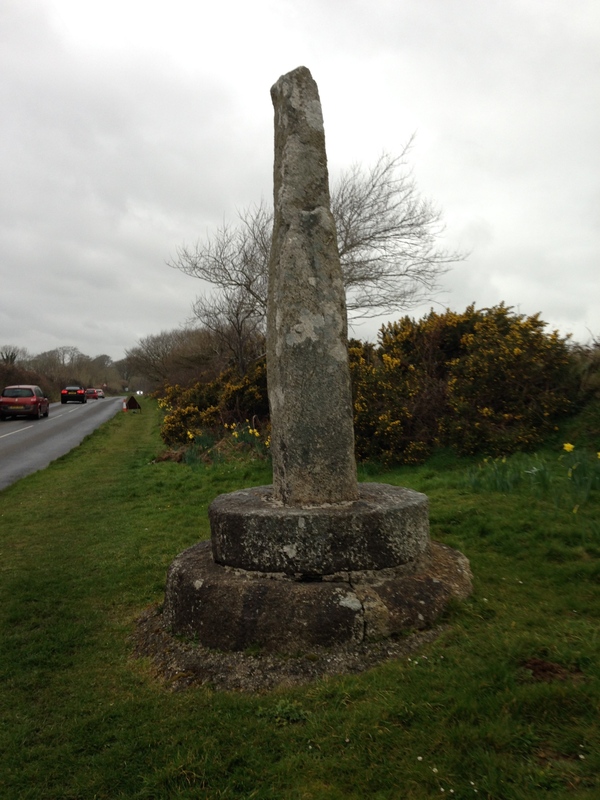 We visited a few sites associated with King Mark, Tristan, and Yseult in Fowey, but the most significant was the Tristan Stone, which marked Tristan’s grave and dated back to 550. Finally, we drove north to Camelford, where we are staying the night. While at a pub for dinner, we ended up having the most interesting conversation with one of the bartenders who gave us instructions for the best way to visit Tintagel Castle tomorrow. 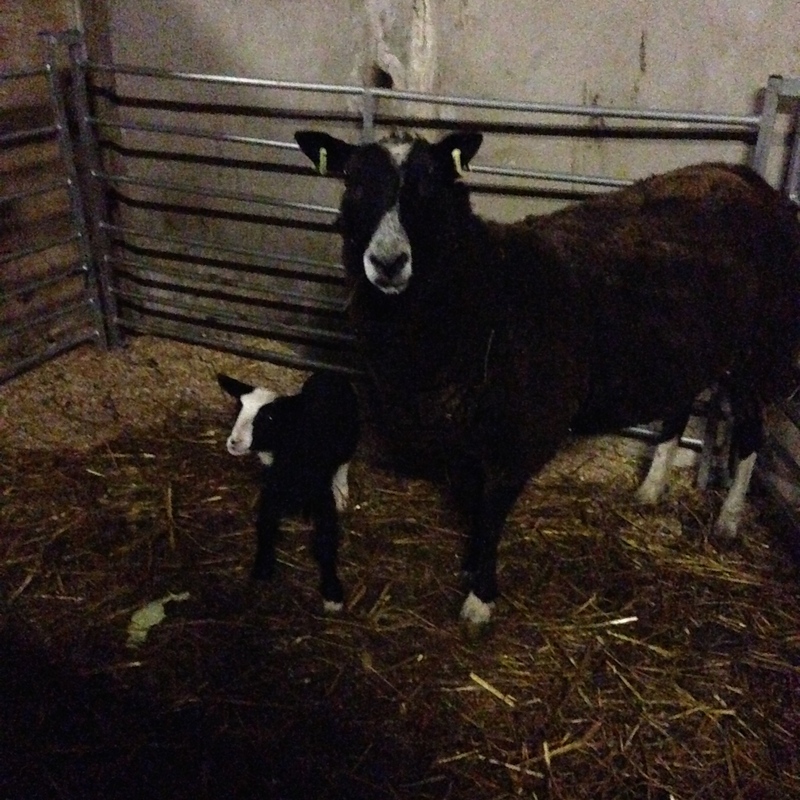 She even took us out to the Moor to see some of the hills and to her family’s farm, where we saw the lambs. It was probably one of the weirdest but best interactions I’ve ever had with anyone—she was incredibly spontaneous, and, as one of the pub patrons described her “a bit mad”. But if anything, it certainly taught me that good things can come from going with the flow. It’s a bit of a coincidence really. For the majority of my life, my family has spent part of our summers at the beach in Avalon, New Jersey. A place named after Avalon, the mystical island that plays a significant role in Arthurian Legend. The island of Avalon, or as it is also frequently called, the Isle of the Apples, is commonly associated with Glastonbury, which was surrounded by water hundreds of years ago, when Arthur would have lived. According to legend, a mortally wounded Arthur was brought to Avalon to be healed following his clash with Mordred at the Battle of Camlann. 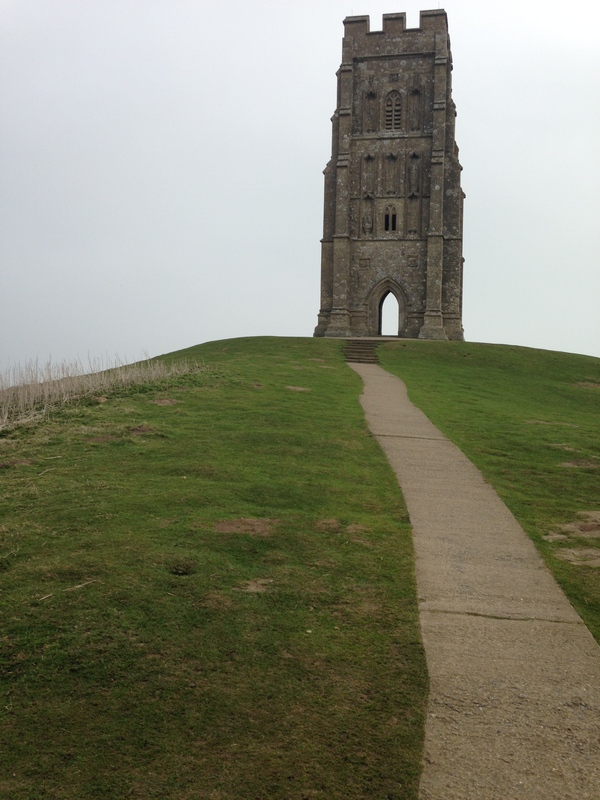 My dad and I spent Thursday exploring two main sites in Glastonbury: the Abbey and the Tor. We started the day off by walking to and climbing up Glastonbury Tor, a giant hill overlooking the town. The Tor is home to what is left St. Michael’s Church; a tower built in the 14th century. In Arthurian Legend, the Tor is mentioned as one of the sites visited by Arthur and his knights during their search for the Holy Grail. It was amazing to climb up the Tor and imagine what climbing up it must have been like for the generations before me. Be it those from the 500s or those who built the churches on top of the massive hill, I kept imagining myself in their footsteps. Although it was brutally windy from the top of the Tor—my ears nearly popped from the pressure—the views more than made up for it. We also visited Glastonbury Abbey later in the day. Glastonbury Abbey is definitely one of the most intriguing places I’ve visited, simply because of the implications it casts over the authenticity of Arthurian Legends. 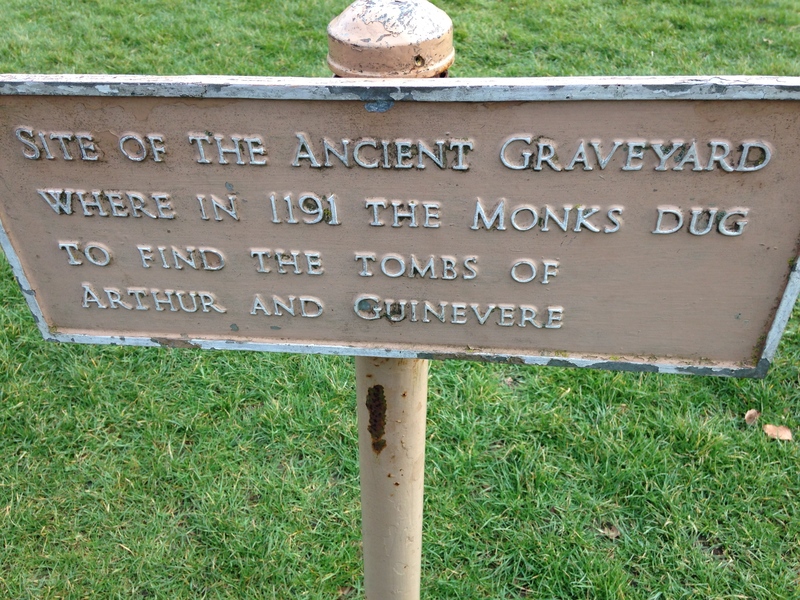 See, in 1191, the monks at Glastonbury Abbey claimed to have discovered the tomb of Arthur and Guinevere. The remains were moved to a black marble tomb in the middle of the nave of the Cathedral, where they remained until the dissolution of the Abbey in the 16th century, at which point they, and the tomb, disappeared. The main question is whether or not the monks were telling the truth—they’d recently come into some financial difficulties, and it’s entirely possible their claims were a 12th century version of a publicity stunt. The romantic in me likes to believe that the monks truly found Arthur’s body. There’s just something indescribably special about standing right where Arthur and Guinevere Pendragon were allegedly buried. But after spending far more time than me going over the evidence (or lack thereof) most experts believe the monks fabricated their claims. Even so, that doesn’t change the fact that Glastonbury has played a large part in Arthurian Legend and in England’s history, making it a special place regardless. Mythology has been a part of my life for nearly as long as I can remember. I’ve always held this deep love and appreciation for all of the legends out there, however one has always been closest to my heart. 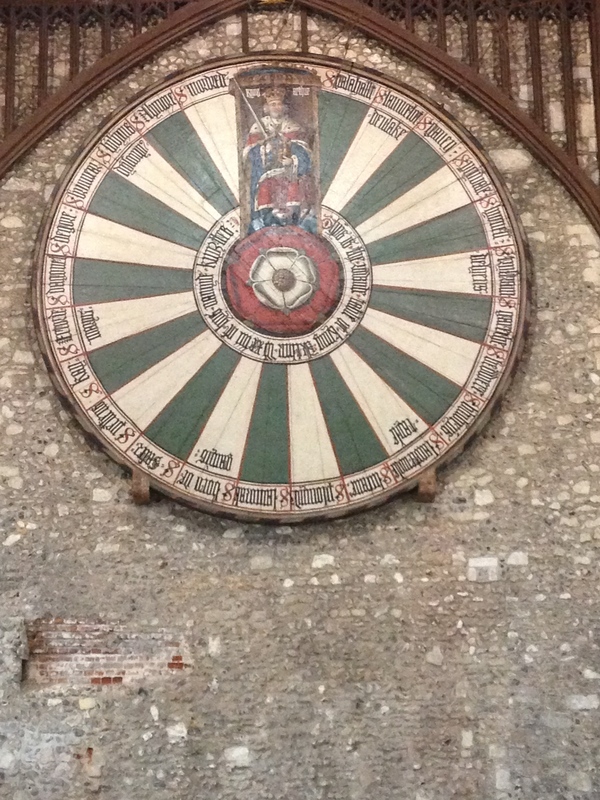 Years ago, I read King Arthur and His Knights of the Round Table for the first time. It was one of many books I’d brought home from the bookstore; at first nothing seemed particularly special about it. I remember that I had the bag of books on the floor in my bedroom, and I’d knelt down to choose one. I picked up the book about King Arthur and didn’t stand up until I’d finished it. I just sat there, on the floor, utterly fascinated. Don’t be mistaken and think this led to my sudden immersion in Arthurian Legend. Because it didn’t. What it did do was start me on a path of slowly learning more and more about King Arthur throughout the years, always viewing the stories of Camelot with fondness, but never truly exploring them as deeply as I would have liked. When considering Senior Project ideas, I mentioned wanting to research King Arthur so offhandedly that I can’t even remember when I first thought of it. But the idea took root, and now in three days I’ll be sitting on a plane with my dad on my way to England. My dad and I are going to travel all around southwest England, visiting sites associated with various Arthurian Legends from Glastonbury Tor to Tintagel Castle. Along the way I’ll be blogging and continuing my research on King Arthur, so when I come back I can write a paper about my own take on Arthurian Legend. I’m very excited, and each step I take in my preparations just makes this all the more real! I attended Westtown from kindergarten to ninth grade, before returning for my senior year, so for the past two years I never thought I would get to complete a Senior Project, but I’m extremely thrilled that I get the opportunity now!